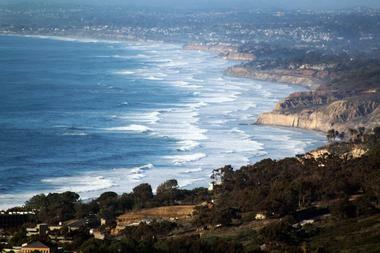 Del Mar is a laid back beach town on the Pacific coast about 20 minutes from San Diego, CA. Called “the place where surf meets turf," Del Mar is famous for its beautiful beaches, world-known racetrack, wonderful weather, and upscale living. It is a place where you can spend the day on the beach doing nothing or fill it with non-stop action. 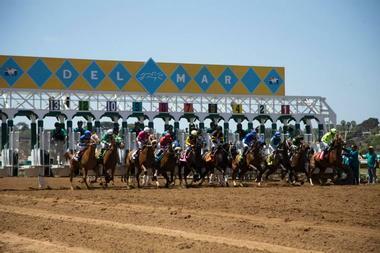 Here are the best things to do in Del Mar. 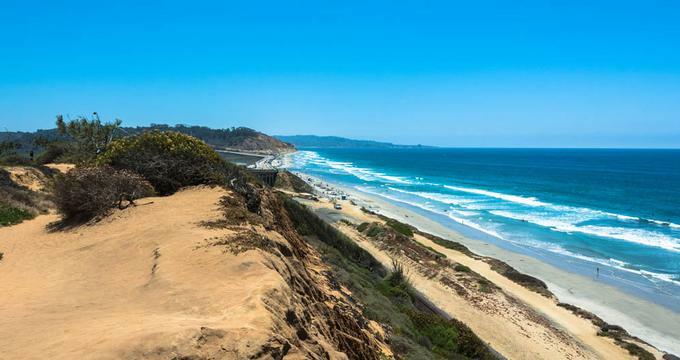 There are about two plus miles of fine sandy beaches in Del Mar, making it perfect for sunbathing, walking, or having a picnic. Del Mar City Beach is the most popular, and its northern part between the River Mouth and 15th street is considered the best in the entire San Diego area, with moderate surf and great swimming. Bluffs line the southern side of the beach, and there are several trails leading down to the beach. Across from the racetrack is a popular dog-friendly beach, naturally called Dog Beach. It is located where San Dieguito River empties into the sea, creating a broad expanse of sand perfect for volleyball. It is not the best for swimming because of strong currents and shallow sandbars. However, it is protected from the wind and is great for making sand castles. 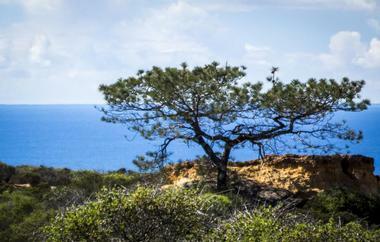 Hiking through Torrey Pines State Natural Reserve, you can imagine how California looked before humans shaped it to their liking: wild, spectacularly beautiful, rich in plant and animal species, unspoiled, and untamed. Torrey Pines reserve is a 1,750-acre reserve located on the rough cliffs above Torrey Pines State Beach that was established to preserve the Torrey Pine tree and other native plants and animals in their natural environment. Del Mar racetrack, where the "turf meets the surf" is aDel Mar Thoroughbred Club horse racing track located in the lovely beach town of Del Mar, about 20 miles from San Diego. 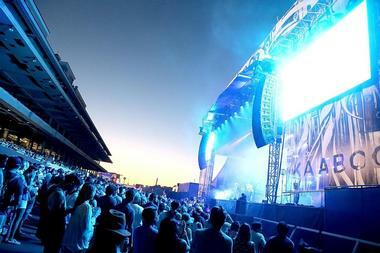 It is one of the biggesthorseracing venues in the States, with the capacity of 44,000 spectators. The racing season is between July and September, and the races have become major social events in the country ever since the venue opened its doors in 1937. The racetrack also hosts concerts on the Seaside Stage, and tickets are free with admission to the racetrack.Kids under 17 enjoy free rides, games, and activities while their parents are having fun at the racetrack. Kaaboo del Mar is a new kind of festival that redefines what we think about festivals. Located at the San Diego's historic Del Mar Racetrack and Fairgrounds, KAABOO is a three-day long live music event that includes more than 100 musical performances on seven stages with internationally known artists such as Lenny Kravitz, Jimmy Buffet, and Aerosmith. KAABOO also features celebrity chefs and great local chefs, superb wine selections from California's best vineyards, samples from the best craft breweries, skilled mixologists, and so much more. There is also a special comedy stage with plush, comfortable seating and a fantastic dance party after hours. The festival will take place from September 16-18, 2016. The Del Mar Farmer's Market is a small but robust farmer's market located at the south end of Del Mar Village. The DMFM offers most of the traditional farmer's market fare you would expect, including honey, fruits, vegetables, and flowers. Unlike many other markets, however, this one is known for its international cuisine, meats, and seafood; seafood in particular is not something often found at a farmer's market. The cheeses and antipasti offerings are also noteworthy. Visitors to the San Diego area might enjoy stopping at the DMFM to buy some goodies for a picnic basket and heading down to the beach for a tasty lunch with a view. Cafe Secret is charming family owned open-air Peruvian restaurant located in the heart of Del Mar's European-style downtown. It is famous for its traditional ceviche and wonderful, warm atmosphere. Literally on the street, the restaurant's tables are surrounded by a profusion of blooming bougainvillea and tasteful Peruvian traditional textiles. The aesthetics are simple and unassuming, letting the food shine. If you have never tasted Peruvian food, Cafe Secret is going to open your eyes. Start with Ceviche Mixto with fresh local fish, jumbo shrimp, octopus, Peruvian scallops, calamari, and New Zealand Green Lip mussels. For the main course, try Aji de gallina, a pulled chicken breast in aji sauce with walnuts, parmesan, and aji. 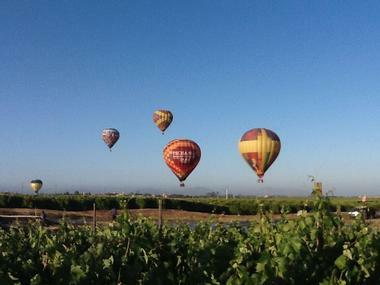 Visitors to Del Mar who would like to see the beauty of the area from a slightly different vantage point should consider a trip with Magical Adventure Balloon Rides. The company offers year-round balloon tours of Del Mar, and they invite guests to enjoy a romantic ocean sunset balloon flight over the elegant homes and golf courses of the region. Included in the price is a one-hour or 4-mile balloon ride, a champagne, juice, or mimosa toast, a commemorative flight certificate, and a souvenir picture. Several special packages are available, including a sunset private basket flight and sunset engagement or re-commitment flight. The Del Mar Surf School provides visitors to the San Diego area with the opportunity to experience the joy of riding the waves. Whether it is your first time on a board or you are in need of a refresher, this surf school is prepared. 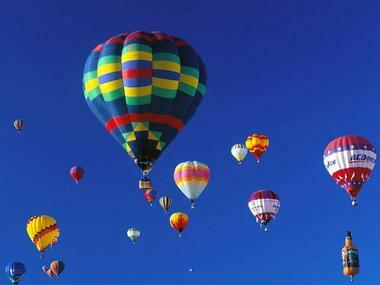 Panorama Balloon Tours provide another aerial option for visitors to southern California. This area is famous for spectacular sunsets, and one of the best ways to experience them is with a sunset balloon flight. These flights take passengers over multi-million dollar properties in Rancho Santa Fe, Fairbanks Ranch, and beautiful Del Mar. 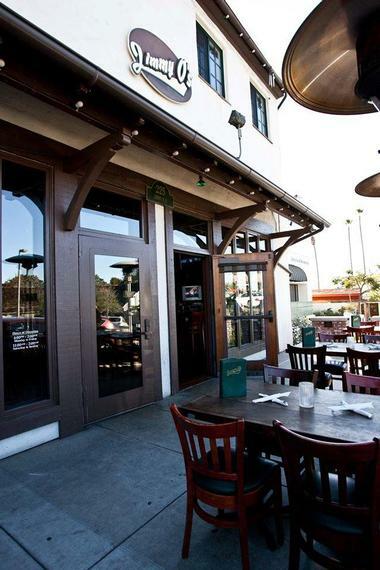 After a day of activities in Del Mar, Jimmie O's is a great place to grab a local craft beer and perhaps a bite to eat. With patio seating and customer acclaimed food, Jimmie O's is in walking distance from the shops of Del Mar, the dog beach, Power House Park, the San Diego Fairgrounds, and the Thoroughbred Club, as well as most hotels in Del Mar. The Fish Tacos and Cajun fries come highly recommended. Jimmie O's offers not only big screen TVs for catching sporting events, but also karaoke, a DJ, and a dance club. For an adventure that is both educational and enjoyable, visitors should consider a stop at the Free Flight Bird Sanctuary. 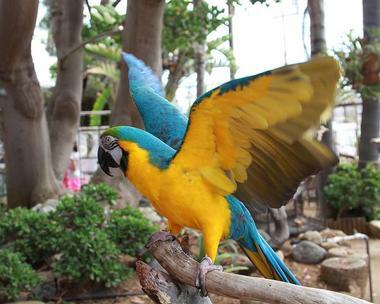 The sanctuary's mission is to re-socialize and re-home parrots in need, while also educating the public about these beautiful and exotic birds. Visitors to the sanctuary walk among the birds and talk with them, as well as assisting with feeding them. Staff members are available to help with handling those birds who like to be handled and to educate visitors about parrot care. While enjoyable for the human visitors, this daily routine helps the parrots become socialized and gives them a better chance to be re-homed, thus creating an advantageous situation for all. The Poseidon on the Beach embodies the Southern California lifestyle - laidback yet sophisticated. Executive Chef Mourad Jamal comes to the Poseidon by way of Morocco, Southern France, and Disney World, bringing with him a world of experiences and recipes. These are reflected in the restaurant's numerous menus. 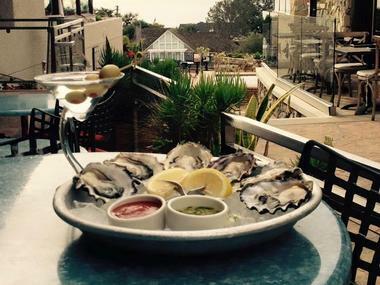 Whether guests are there for lunch, brunch, dinner, dessert, bar food, or just to enjoy a local craft beer with a view of the famous Del Mar sunset, the available culinary options are impressive. Of particular note is the Mini-Taco menu available Mondays and Thursdays. 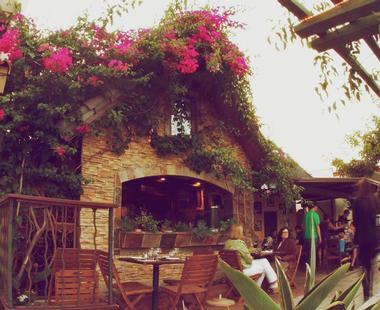 Another dining option of note in the Del Mar area is Jake's Del Mar. Part of a family of restaurants in the Southern California area, Jake's offers lunch, dinner, and bar menus but is most famous for its extensive Sunday brunch offerings. The breakfast selection of brunch includes favorites such as Lemon Ricotta Pancakes, Langostino Lobster Omelet, and Banana Stuffed French Toast. But the star is the Eggs Benedict with a choice of ten different toppings. Those looking for something more lunch oriented might wish to try the Mac & Cheese Stuffed Meatballs or Lobster & Shrimp Rajas Tacos. In 2006, locally born and raised professional Chef Carl Schroeder opened his now award-winning Market Restaurant + Bar in Del Mar. With two creative and innovative professional chefs in the kitchen, this restaurant promises a culinary adventure that is sure to impress. 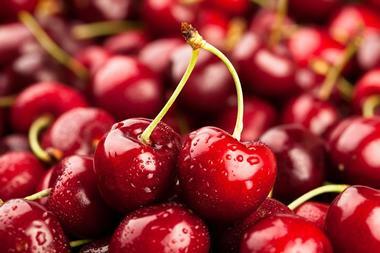 The menu consists of a selection of seasonal dishes created from fresh, locally grown, hand-selected ingredients. The menu does however change daily as the chefs find exciting new menu items that take advantage of the best produce, seafood, and meats available at any given time of the year. They offer a dinner, sushi, and tasting menu, meaning guests are sure to find something new and exciting for their Del Mar dining experience. What would a visit to Southern California be without some spectacular seafood? 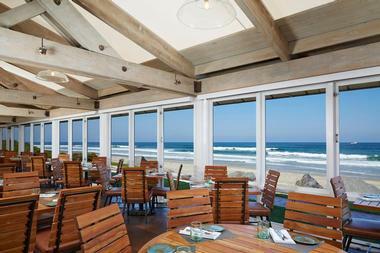 Pacifica Del Mar is an award-winning seafood restaurant featuring both coastal cuisine and stunning views. 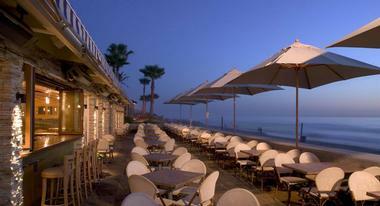 The restaurant's dramatic setting is the perfect canvas for the highly acclaimed cuisine. The Pacifica offers a lunch, dinner and weekend brunch menu, as well as a 2-course Sunset Dinner menu. 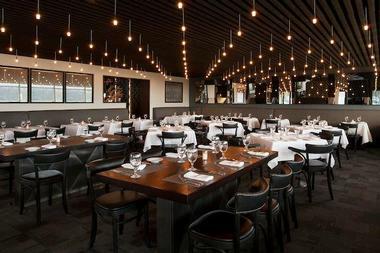 Starting at 6pm, this pre-fixed price menu includes offerings such as Sugar-Spiced Salmon with Chinese Long Beans, Mustard Sauce, and Garlic Mashed Potatoes, Cavatappi Pasta with Rock Shrimp, Artichokes, Spinach, and Arugula Pesto, and Mustard Catfish, Mustard Marinade, Green Onion Aioli and Yukon Potato-Corn Succotash.